Until September 27th, Head for Points is running a fantastic competition in association with Air New Zealand to win a trip for 1-3 people to Los Angeles! If you haven’t entered yet, you will find full details and the entry form on this page. The competition closes at midnight on Sunday – time is running out if you haven’t entered so far. 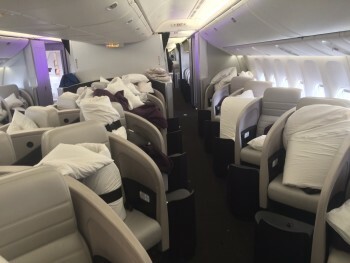 As part of the competition, I am running a series of articles to introduce HFP readers to the on-board product that Air New Zealand offers on its daily Boeing 777-300 flights from Heathrow to Los Angeles (for which you can buy stand-alone tickets) and then on to Auckland. I have already taken a look at Economy – including the innovative Economy Skycouch – and their impressive Premium Economy cabin. Today, I am taking a look at Air New Zealand Business Premier. I had a tour of the Air New Zealand plane whilst it was on the ground at Heathrow a few weeks ago so I could see for myself what is on offer. 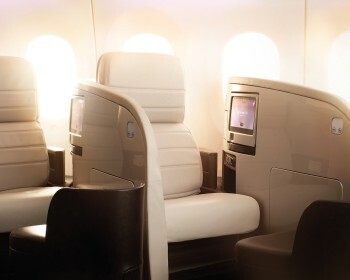 Business Premier is the flagship Air New Zealand product, voted “Best Airline for Business Travel” in the Guardian / Observer 2014 travel awards. The seat is very similar to the one used by Virgin Atlantic in Upper Class, as well as Air Canada and a number of other airlines. The key benefit of the seat is privacy. Unlike the British Airways ‘yin yang’ Club World layout, where many seats do not have direct aisle access, Business Premier passengers can all step directly into the aisle and are not facing other people directly. 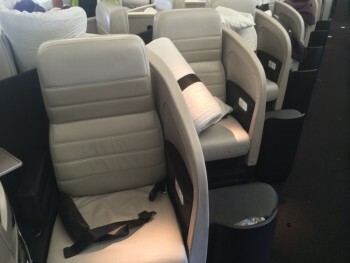 The cabin comprises 44 Business Premier seats. Each is 80 inches long with a width of 22 inches (33 inches at the shoulder). It goes without saying that the seat reclines a full 180 degrees. The leather chair flips over when turning it into a bed, meaning that you get the dual benefit of a leather seat and a breathable cotton sleeping surface. As with its other cabins, Air New Zealand has produced a sleek You Tube video which you can see on this page. IFE is provided by a 12.1″ touch screen as well as USB and iPod sockets. I obviously didn’t get a chance to sample the on-board food and drink during my tour but the wine list does feature a good selection of New Zealand growers. Outside of formal meal times, you can order snacks via your touch-screen IFE monitor – a service that is also available in the other cabins. In the current Air New Zealand sale which ends today, prices start at £2,310 return for Business Premier to Los Angeles. That compares to £449 for Economy and £870 for Premium Economy. Air New Zealand is a member of Star Alliance so you would accrue miles in any of the Star programmes such as Miles & More. Air New Zealand also has its own loyalty scheme, Airpoints. If you want to find out more, there is a dedicated Business Premier page on the Air New Zealand website here. If you haven’t yet entered our ANZ competition, click here. When the BMI FF scheme was still running, I flew ANZ J many times. I absolutely loved it. It just blew BA J out of the water back then, even more so now. Not only is the seat great, the staff are amazing. So friendly, attentive and funny, too. The food is edible (BA please note, it is possible to cook an in flight steak properly), and the wine list is excellent. If they were in oneworld and I could use or get avios to fly them again, I would in a heartbeat. On the third sector, the check in guy said to me, we notice you seem to like 1A, it is currently reserved, but not occupied, let me try for you. Turned out the guy in the other row 1 seat was the ANZ CEO, but I didnt know until some way through the flight. I did wonder why the staff seemed to absolutely and genuinely dote on him. I happened to watch some promo in flight that he appeared in, dressed up as something daft, and asked him if it were he. He was a really lovely bloke too. Very different from WW. I dont get where people the idea that any gains that Rob makes from the time he spent running the site come at a direct cost to them! The competition cost nothing to enter, and whether Rob makes any incremental advertising revenue from the potentially increased traffic/ readership is irrelevant to me – I dont stand to lose anything from the success of the blog!